The Energy-efficient Lightbulb & Bug Zapper All-in-One! No Spray, Chemicals or Fumes! Protects up to 500 sq. ft.! If peksy mosquitoes and other flying bugs keep you from enjoying the outdoors you need ZappLight. 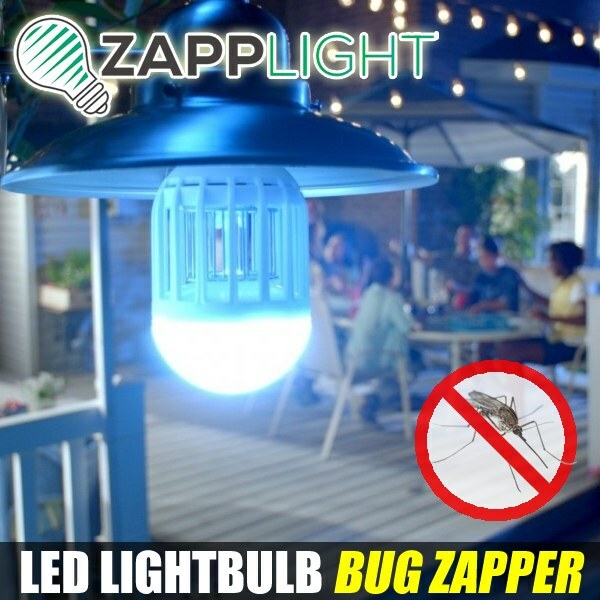 As seen on TV ZappLight is the all new, powerful bug zapper that utilizes a super-bright LED light to attract flying insects into its electrical grid and eliminates them on contact. Simply replace your existing bulb with ZappLight and bugs will be attracted to the 60 watt, LED bulb from up to 500 feet away. ZappLight is safe, 100% chemical free and lasts up to 15,000 hours, protecting your family and pets from virus-carrying insects. Plus, you can use ZappLight indoors or outdoors so you can rest easy. If you can screw in a light bulb, you can protect yourself from mosquitos, flies and other flying insects. Works in any standard 110-volt socket. Perfect for the porch, patio and more. Includes 1 Zapp Light. This light helps keep the bugs away. It did not kill any bugs and was a waste of money. It has made big difference. I hardly see any flying bugs around.